The solution to change the position of the desktop clock, for example, you can also place it on the second monitor! Open ergo Start TheAeroClock if it is already running, then just bring it to the foreground using the To-Tray symbol. 2. 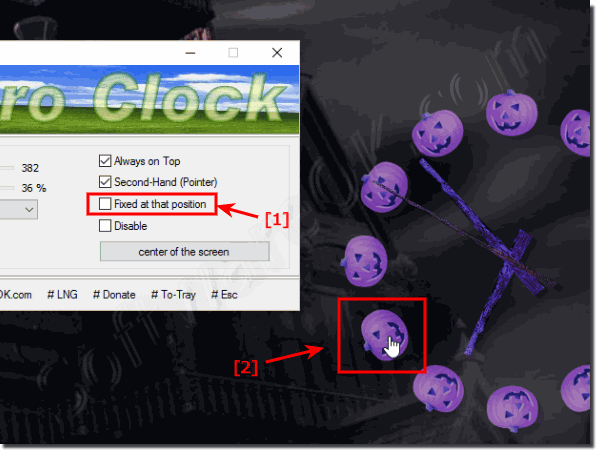 Move your mouse over a non-transparent area of the desktop clock in this case, it is the gourd (... see Image-1 Point 2) , hold the mouse down and position it wherever you want. Works even if you are using multiple monitors on Windows. (Image-1) Change the position of the Desktop clock! TheAeroClock - FAQ-6: How do I change the position of the desktop clock? Hi! Very nice clock! But I have 2 monitors and I would like to place it on the second one, and have more flexibility to where I can position it. ?